Born in Nicosia, Cyprus in 1965. Education: Ealing College of Higher Education (LL.B. Hons.) (1989), Inns of Court School of Law, Honourable Society of Gray’s Inn, London (Barrister-at-Law) (1990). He gained hands-on experience working at a City of London solicitor’s firm prior to moving to Cyprus. In 1995, he also worked as a visiting attorney at Corboy & Demetrio in Chicago and Baker & Hostetler in Washington, D.C. in the United States. 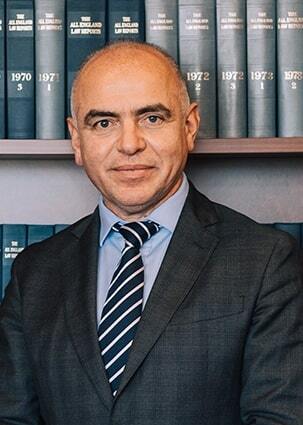 Member: Cyprus Bar Association, Bar of England and Wales (Honourable Society of Gray’s Inn), President of the Cyprus Chapter of the European Court of Arbitration, Vice President of the AEA International Lawyers Network. Practice Areas: Corporate and commercial law, international tax planning, international trade, cross-border disputes – private international law, real estate, investments, alternative dispute resolution, medical negligence, intellectual property law, franchise law, Internet and media law, litigation.